On 25-26th July 2015, over 400 teams totalling nearly 1,700 participants took on Trailwalker 2015 – attempting to cover 100km across the South Downs in under 30 hours. As ever, the event was brilliantly organised and marshalled by the Queen’s Gurkha Signals and our charity partner Oxfam. Despite some less than favourable weather on Day 2, trekkers showed an incredible enthusiasm and resilience to reach the finish line. Galvanised by the disastrous events of April and May, teams took on their fundraising challenge with a passion and have so far generated nearly £1 million for Oxfam and the GWT. In solidarity with the Gurkhas and in the wake of the earthquakes, Oxfam will also be devoting a considerable amount of their funds to Nepal-based projects. GWT Chairman and former Head of the British Army, General Sir Peter Wall, personally took on the challenge this year, along with Trustee Jeremy Brade and Trust supporters Chris Kemp and Mark Brown. Their team had raised an exceptional £217,000 by the time the race began. For the second year in a row, the 1st Battalion The Royal Gurkha Rifles’ Team A were the runaway winners with an astonishing time of 9h58. 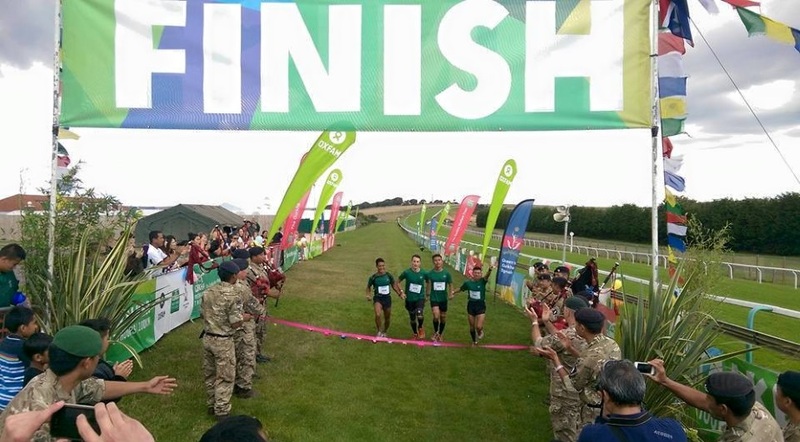 Despite their disappointment at narrowly missing out on the course record during the Gurkha bicentenary, the team were an incredible example of the endurance, pride and team spirit embodied by the Brigade of Gurkhas. 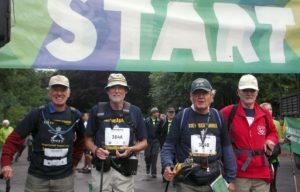 The award for the oldest team on the course must surely go to The Pukka Burhos, four British ex-Gurkhas who, despite their average age of 75, managed to finish in less than 30 hours and raised over £5,000 along the way. We were also delighted this year to welcome Gurkha 200 Ambassador Fiona Fullerton to set off some of the teams and cheer on weary runners. It is thanks to the efforts of fundraisers such as the intrepid Trailwalkers that we are able to provide vital aid to Gurkha veterans, their families and communities in Nepal. Funds raised this weekend will support our earthquake relief work, especially as we begin rebuilding following the current monsoon. Anyone interested in taking on Trailwalker 2016 can find further details on the Trailwalker webpage.